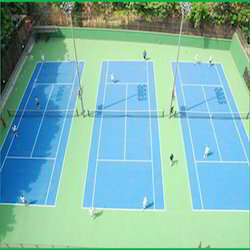 Prominent & Leading Manufacturer from Mumbai, we offer basketball sports flooring services, tennis court flooring, acrylic synthetic courts service, athletic track flooring services, epdm playground flooring and table tennis court flooring. We are rendering Basketball Sports Flooring Services. These services are accomplished by professional team who has prosperous industry proficiency and practice. To rendering this service in proficient way, our professionals employ the advanced techniques. Moreover, we render this service at reasonable prices. • The Perfect Basketball Floor: The system provides an extremely durable hardwood surface which makes for reliable and consistent performance. 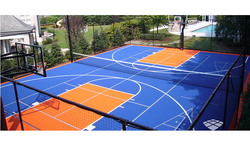 • Basketball Court Specifics: Sport Indian and Basketball Indian’s data sheet outlines specific regulations for basketball courts at community, club, premier level regarding the dimensions, markings, flooring and lighting. The regulatory size of a basketball court at national level is often the second biggest in any sports hall, behind netball. The table below shows the recommended size of a basketball court for national level matches. • Changes to Basketball Court Markings: If you require revised court markings to meet new regulations, such as those imposed by FIBA for Basketball, we offer solutions ranging from localised cleaning and painting to the specific area that we will be applying the new lines, to a complete sand and re-seal (wood floors only) to restore your entire floor to its new condition with a complete set of new lines. • Basketball India: Basketball India regularly produces a wide range of books and journals, manuals on coaching, refereeing and table officiating alongside various other promotional/ information pamphlets. Amongst these are documents concerning facilities management. Basketball India have also worked alongside Sports to create a Developing The Right Sports Hall document providing recommendations on the ideal basketball court. A one Wood Craft has been serving up Tennis Court Flooring longer than anyone else in the game. 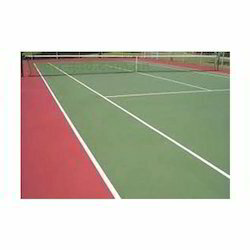 We have manufactured the highest quality court tiles, offering safe, durable, high-performance flooring to the most prestigious tennis programs and the most enthusiastic home players. Experience. As the oldest India n modular tile manufacturer, A One Wood Craft has been providing high-quality solutions since 2011. Quality. We did not settle for anything less than the highest standards for materials and manufacturing. Performance. Our products are engineered to enhance comfort and performance. It will show in your players’ game. Safety. A One Wood Craft products were developed with injury prevention in mind. Durability. Protect your investment by choosing long-lasting flooring products. Ease. Every A One Wood Craft product was designed to be portable, low-maintenance, and cost-effective. Service. We provide outstanding support from design to installation and throughout the life of your court. We are the leading Sport Flooring Service provider . A One Wood Craft supplies and installs world class synthetic surfaces for large athletics track projects throughout India. Our expertise englobes design, site prep, drainage and high-performance surfacing for running tracks. 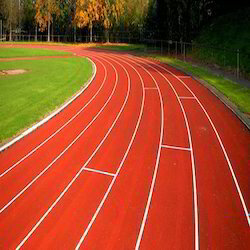 A One Wood Craft Surfaces is extremely proud to have achieved the first IAAF certification in India for a running tracks. Our tracks are made of European quality and highly important for national & international athletes games where athletes will be running at full speed on the surface. 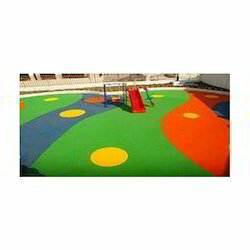 Owing to our vast acquaintance of this area, we are accomplished to render EPDM Playground Flooring to our valued customers. 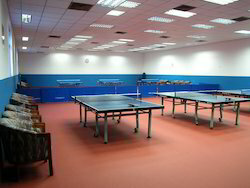 Table Tennis Court Flooring required for a table tennis area is quite important, considering that player grip is critical to avoid injuries due to slipping or twisting. This floor is available with a trolley system to make transport and removal of the floor extra simple.